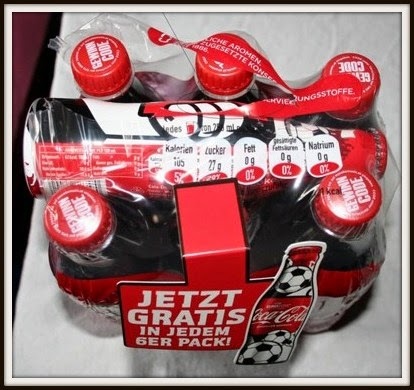 This Austria aluminum bottle was not-for-sale item. It was free with any purchase of 6-pack pet bottles during the period of UEFA. It is very limited and hard to find it. 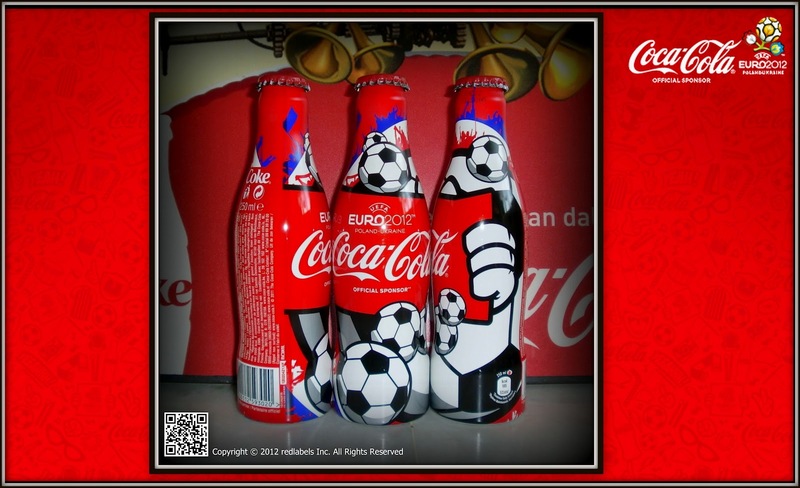 The 2012 UEFA European Football Championship, commonly referred to as Euro 2012, will be the 14th European Championship fornational football teams sanctioned by UEFA. The final tournament will be hosted by Poland and Ukraine between 8 June and 1 July 2012. It is the first time that either nation has hosted the tournament. This bid was chosen by UEFA's Executive Committee in 2007. The final tournament features sixteen nations, the last European Championship to do so (from Euro 2016 onward, there will be 24 finalists). Qualification was contested by 51 nations between August 2010 and November 2011 to join the two host nations in the tournament. The winner of the tournament gains automatic entry to the 2013 FIFA Confederations Cup hosted by Brazil. 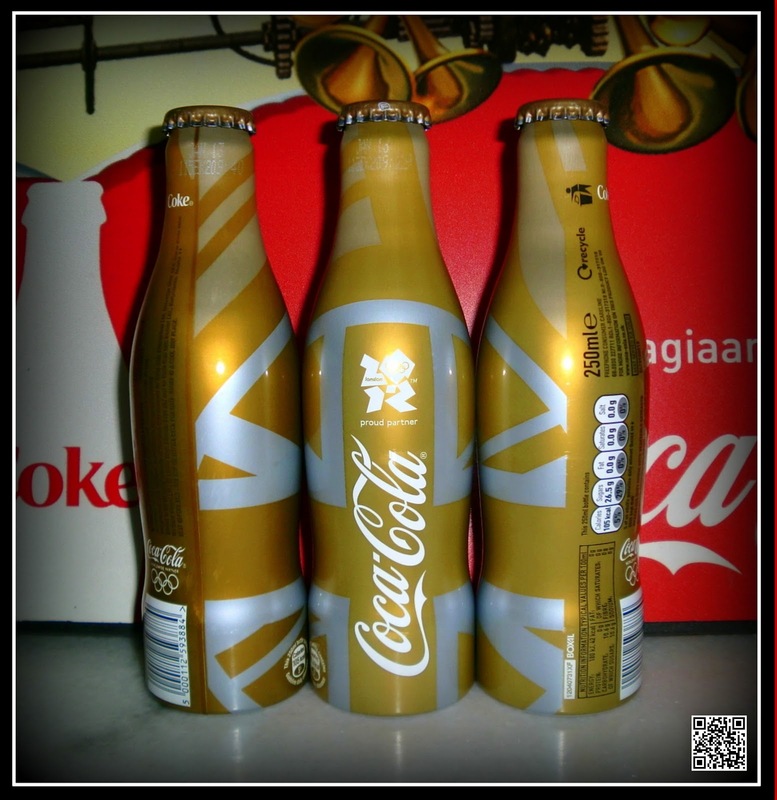 Available exclusively at Selfridges, Coca-Cola has created a limited edition bottle in celebration of the London 2012 Olympic Games. 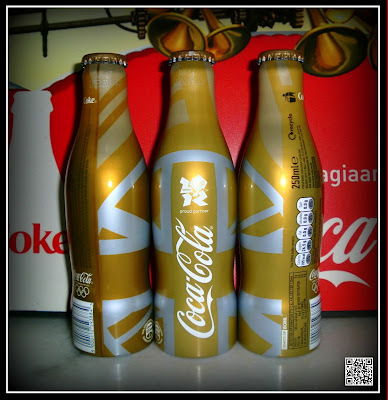 Decked in a gold and white Union Jack, the iconic bottle has been given a golden British makeover. English-born portrait and fashion photographer, Rankin, has assisted the 1928-to-present Olympic veteran brand Coca-Cola in creating a limited edition bottle to celebrate the exhilarating London 2012 event. Cited by Coca-Cola Great Britain, the silver-tone bottle features a photograph by Rankin that “symbolizes the handover of the Summer Games from Beijing to London with a simple white rose between two hands”, a mighty message for a distinctive bottle to mark an iconic event. LONDON, 1 June 2011: Coca‑Cola today joins forces with Dizzee Rascal, Eliza Doolittle, You Me At Six and a number of London 2012 hopefuls to launch a nationwide search for inspirational young people ‑ our Future Flames ‑ to carry the Olympic Flame during the London 2012 Olympic Torch Relay next summer. 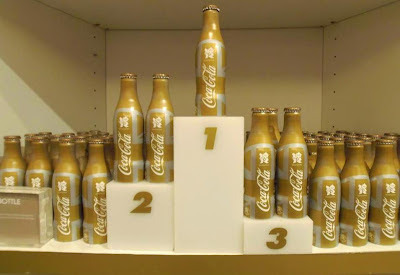 Coca‑Cola, a Presenting Partner of the London 2012 Olympic Torch Relay, will today launch its nominations campaign to find Future Flames at a special event in West London. Coca‑Cola will be calling on everyone across the UK to nominate the Future Flames they know: young people who use their passion in areas like sport and physical activity, music and dance, and community and the environment; to spread happiness in their local communities. The event will include appearances and performances by music artists, athletes and inspiring young people ‑ our Future Flames Ambassadors ‑ who embody the types of people the Future Flames campaign aims to celebrate. The event will be followed by a national 'Torch Tour' as Coca‑Cola travels around the UK this summer to encourage everyone to nominate the Future Flames from their area. The search to find the UK's Future Flames comes as a survey by Populus reveals that while 89% of 16‑24 year olds undertake activities that contribute to their local community, such as volunteering and fundraising, less than half (47%) of older people recognise this contribution to society. In addition, only one in ten (10%) respondents agreed that people think teenagers are kind, and just 9% agreed that people think they are considerate. However, 79% of adults do recognise that society's perception of teenagers is negative and 72% feel that more needs to be done to improve this. Simon Baldry, Managing Director at Coca‑Cola Enterprises Ltd (CCE), comments: "Coca‑Cola Enterprises is proud to be a local business operating across the length and breadth of Great Britain, working closely with our local communities. Coca‑Cola's London 2012 Olympic Torch Relay Future Flames nomination campaign will bring the excitement of the Olympic Games right into the heart of those very communities and CCE is working closely with our customers across GB to ensure that this once in a lifetime opportunity will be fully activated in‑store." "It's time to recognise young people in this country and Coke's Future Flames campaign does just that. See the person, not the age. I see young people judged all the time and there's negativity about them. But people should look at reality ‑ many young people are making a positive difference but no one hears about it. We can change that by nominating the Future Flames we know." "It's great that Coke is giving young people the chance to be involved in something as amazing as the London 2012 Olympic Torch Relay. The youth of the UK get such bad press which I really don't think they deserve. We all need to recognise the huge amount of positive things teens are doing and what they give back to the community ‑ everyone needs to nominate the Future Flames they know." "I know what it's like to be passionate about something and to try to use that passion to improve other people's lives. The fact that so many young people are doing that but not getting any recognition for it ‑ the opposite, in fact ‑ is really worrying and something we have to sort out. We have to encourage young people to be the best that they can be, and celebrating their achievements by nominating the Future Flames we all know is a good way to reward them." Future Flame Ambassador Andrew Lofthouse, 19, Stockport volunteers with StreetGames, a groundbreaking national charity which develops sport in disadvantaged communities and makes sport accessible to young people regardless of their social circumstances. Andrew has been selected as an Ambassador Future Flame to inspire everyone to nominate people they know that might be like him for the chance to become a Future Flame. At 16, Andrew became one of the youngest instructors of Thai Boxing, using it to change his horizons at a difficult time in his life. He is now chairman of charity Young Bank, volunteers in his community and mentors other young people. "I really want to help inspire other people to change their lives for the better, so being part of the search for other Future Flames to join me is amazing. We need to show people that if you put your mind to something and stick together as a community you can do awesome things." Nominations can be made at www.cokezone.co.uk until 05/09/11. Coca‑Cola is looking for young people of Britain who have a passion for activities such as sport and physical activity music and dance, and community and the environment. The Coca‑Cola Company has been continuously associated with the Olympic Games since 1928 ‑ longer than any other corporate sponsor of the Olympic Movement. The Company works with National Olympic Committees in more than 200 countries to help athletes train and compete. More than 90 percent of Coca‑Cola's investment in the Olympic Games is directed to athlete development, supporting National Olympic Committees, and to assisting staging the Games. 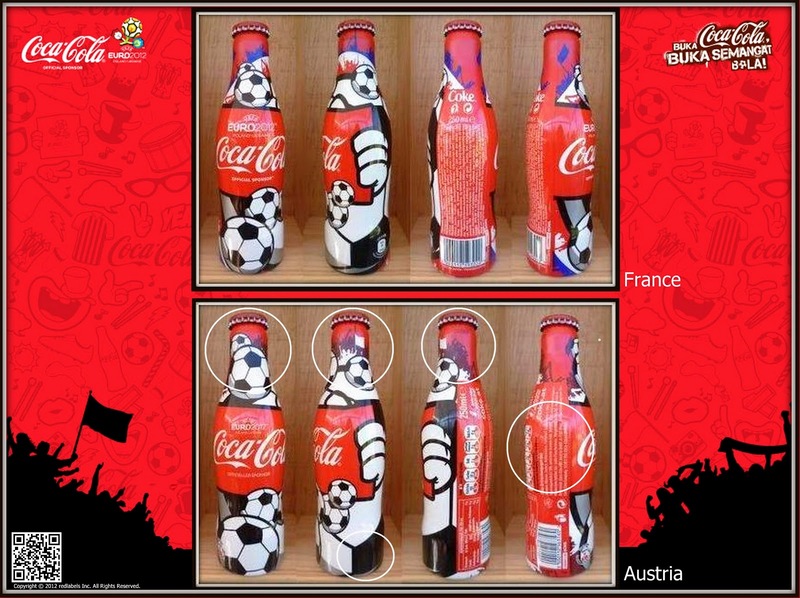 Products of The Coca‑Cola Company refresh athletes, volunteers, officials and spectators during the Olympic Games. 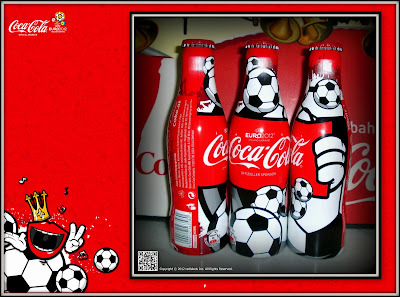 The Coca‑Cola Company is the exclusive nonalcoholic beverage provider to the Olympic Games through 2020.